This article (part of a series of Strategy Tips) was originally posted on AEG's and Artipia's websites. The Warden is the group’s healer. Her main goal is to keep all the players alive but she also has some nice tricks up her sleeve. - When playing with the Warden, your top priority is mastering healing abilities. You should make sure to take a few of those early (ideally Rejuvenating Gust or Mend Wounds) so that you can use at least one every round. - When you reach a point where you can consistently heal the other players, make sure to let them know. That will make them not care that much about the minions and will allow them to focus more on what their characters do best. - Some of the Warden’s abilities allow you to apply the effects of other players’ abilities. These can be super useful when used at the right time and you should plan for those along with your teammates. - "Copying" effects are also very useful since they allow you to double the amount of healing you normally do. It is not unusual for a Warden to consistently use Ripple on a Rejuvenating Gust, healing all players for 4 damage every round. - While healing is your top priority, after a point you will be so good at it that you can help in other fields as well. For example, you may focus on damage-dealing abilities and help deal with the minions more effectively, or you may master some Insight-producing abilities to help with the Seals. Especially if you have many copying effects on your character, even with a couple of “other” abilities you can be very effective. - Restoration is probably the best combo-enabler in the game. Not only does it allow you to heal other players, you get to repeat their most powerful effects. It works very well with abilities that exhaust themselves like the Mystic’s Torrent of Elements and the Avenger’s Consuming Rage. - When you have Mana Cleansing, make sure to ask the other players to place the damage they take, on mana abilities you will be needing. 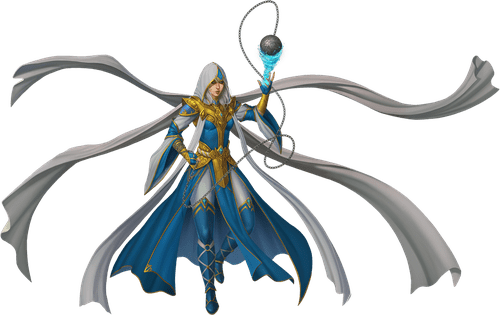 - The Order of the Celestial Tide is the best choice for the Warden due to the abundance of Water mana which is crucial for her abilities. It also contains 3 copies of the much needed Ripple which you will be using constantly. The Order of the Everlasting Waterfall also has 3 copies of Ripple which makes it another good choice. - The Warden can easily use any of the weapons and incorporate it into her plan. The Chain of Balance has a slight edge due to the Spiritual Trance – the most powerful copying effect in the game. The Staff of Enlightenment is also an interesting choice. Not only does the Healing Riposte fit with all the healing that you do, it also has Awareness which, if you plan accordingly, will allow you to go after Relics if you like.